Hurricanes have really been in the news for 2005. With Katrina and Rita, many scientists think that the number of hurricanes is on the rise. There are three terms used to describe these huge storms. 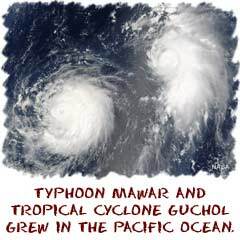 The generic term is tropical cyclone. Local labels include hurricane and typhoon. It all depends on whether you are in the northern or southern hemisphere. If you're from the United States, you use the term hurricane. These storms don't just happen, they are created over several weeks, and they don't even form near the U.S. Hurricanes that appear in the Caribbean Sea actually form in Africa (near Ethiopia). Slowly in the warmer summer months, those storms travel across the Atlantic Ocean until they get to the Caribbean. Over the Atlantic they are decent sized storms, but once they hit the super heated waters of the Caribbean they grow to enormous sizes. 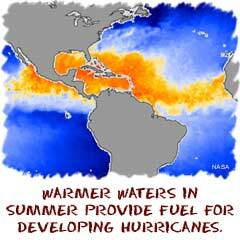 As we just mentioned, hurricanes happen during the summer and early fall in the northern hemisphere. This is the time when the ocean waters are at their highest temperature (over 80 degrees Fahrenheit). You know that warmer water has more energy and there is more evaporation. The temperature and evaporation work together to fuel these monster storms. The technical terms are convection (movement of air masses because of heat) and condensation (when the evaporated water condenses). That condensation occurs when the warm humid air begins to cool and releases more energy into the storm. Combine that water and energy with the spinning of the Earth and the Coriolis Effect and you've got yourself one massive spinning storm. After a tropical storm is upgraded to a hurricane, meteorologists use the Saffir-Simpson Scale to label the storms. The scale breaks the storm into five categories based on wind speed. A category five hurricane has sustained winds that are over 155 miles per hour (240 km/h). Beyond the wind speed, there is also an effect called a storm surge that is different for each storm. The surge is dependent on the strength of the storm and the location where it makes landfall. A storm surge is basically a big dome of water that moves from the coast inland. It could be as small as a couple of feet to over thirty feet high. Even though wave heights in a storm are very high, a storm surge is not a big wave. Two areas can create a storm surge. The first is directly in front of the path of the storm. As the hurricane moves, it pushes huge amounts of water onto the coast before it makes landfall. The second surge is smaller and found right beneath the eye of the storm. Because of the low pressure in the eye compared to the surrounding walls, the surface actually rises in the center. That dome of water will also go onto the shore when the hurricane hits.